Stratford, a rural town, is 20 km north-west of the Gippsland lakes and 190 km east of Melbourne. It is situated on the Avon River which rises in the alps north of Maffra and enters Lake Wellington. European discovery of the Stratford district began with Angus McMillan naming the Avon River in early 1840, apparently after an Avon River in Banffshire or in West Lothian, both in Scotland. In June 1842 William Raymond took up a pastoral run on the east side of the river centred slightly north of the present town. Named Stratford, presumably by Raymond, the run was of 16,000 acres, and the inspiration for the name was possibly Shakespeare's Stratford-on-Avon. Alternatively, the site of the future town had a fording place across the river. Raymond built the Shakespeare hotel at Stratford in 1848 and two years later a blacksmith's shop opened. 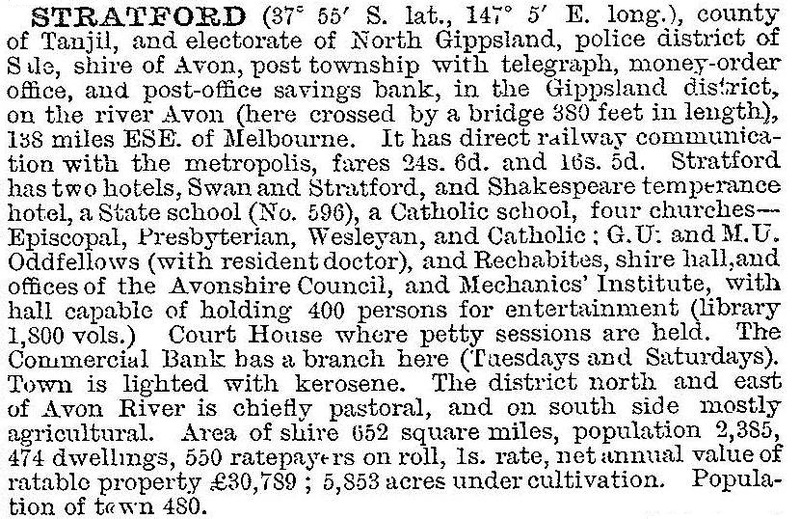 A town was surveyed in 1854, at about the time when Gippsland cattle were being driven southwards through Stratford to Port Albert for transport to Melbourne and Tasmania. In 1860 gold was discovered north of Stratford at Grant (Crooked River), and supplies were carried through Stratford. There was already a post office (1858), a Presbyterian church (1857) and a school (1858) in the church. Catholic and Anglican churches opened in 1864 and 1868, and a district road board (1864) was located at Stratford. It became Avon Shire in 1865. A State primary school was built on a new site in 1911 and a Catholic primary school opened in 1929. After World War I soldier settlers took up farms on subdivided estates in Avon Shire, but many farms proved to be unviable: bracken, falling butterfat prices and rabbits were some of the problems. The outbreak of World War II brought good wool prices and a flax mill west of Stratford. Prosperity well and truly returned in the 1950s with a reduced rabbit population and increased primary produce prices. A soldiers' memorial park was laid out in Stratford in 1949 with an infant welfare centre, and the saleyards were replaced with a sports and recreation centre. A swimming pool was opened in 1963. The big problem was building a town bridge that could withstand flooding by the Avon River, and that was resolved in 1965 at the bridge opening ceremony that marked the centenary of local government. Stratford's population increased steadily during the 1970s-80s. The town successfully fought off a proposal to merge its shire with neighbouring Sale City and Maffra Shire (1986), but eight years later it was swallowed whole by Wellington Shire as residents helplessly looked on. The town also lost some of its bank agencies and other facilities, but in 1989 it began its successful Shakespeare-on-Avon festival, linked with similar worldwide events. There are three active churches, State (91 pupils, 2014) and Catholic primary schools, three recreation reserves, a bowls club, a hotel, a motel and a caravan park. The court house and the mechanics' institute are used as a theatre and for community meetings. The railway, closed during the 1990s, was reopened in 2004. In 2010 Gunai-Kurnai claim to Crown land in Gippsland was recognised with the signing of a native title agreement in Stratford.